Józef Rybak is the Director of Administration of Local Government of Šalčininkai district only since June 2014. Like his predecessor, Boleslaw Daszkiewicz, is being chased by bailiffs for failing to remove the boards of bilingual street names from private homes in some localities of Šalčininkai district. The former Director of Local Administration of Šalčininkai district – Boleslaw Daszkiewicz in May 2014 paid a fine of more than 47 thousand litas, imposed on him by the court for failing to remove signs with Polish street names of private homes in several towns of Šalčininkai district. However, the case was not completed. Bailiffs prosecute the new head of a district administration demanding the execution of two court decisions: from 2008 and 2013. Both unimplemented court judgments are related to the signs with bilingual street names in towns of Šalčininkai district. In both cases, Józef Rebak is threaten with heavy penalties: for each day of delay in carrying out the decision of the court, bailiffs are demanding payment of one thousand litas. In July, the district court in Druskininkai considered the request of the bailiff Jane Jakimavičienė, but at the request of Józef Rybak, who wanted to become familiar with the case file, the case was postponed. The next court session is scheduled for October 2nd. The district court in Šalčininkai looked into the request made by the bailiff Tereza Gerasimovič last week. The next meeting of the court will be on August 26th, Tadeusz Ziminski was summoned by the governor of district of Eišiškės. The case examined by the court in Šalčininkai concerned the same court ruling, on the strength of which Boleslaw Daszkiewicz has already paid the penalty. 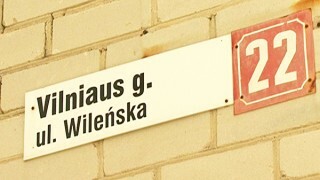 Representative of government of Vilnius district, however, claims that although the penalty has been paid, in some places signs are still hanging. “The penalty should be determined by the court. It is difficult to estimate how high the punishment will be. All the circumstances will be taken into account. We think that the decision will be made ​​when all the signs will be removed” – said Rokas Jonikas representing the representative of the government of the district of Vilnius before the court. Jozef Rybak informed that the representative of the government of the district of Vilnius demands from the administration of the local government of Šalčininkai to implement a new mode of marking streets and roads. In accordance with the recently adopted regulations street names must not be placed on buildings, but on special columns. Until 31st October local government of Šalčininkai district must estimate how much it will cost placing the columns and placing on them signs with street names, and set a deadline for the implementation of this regulation.